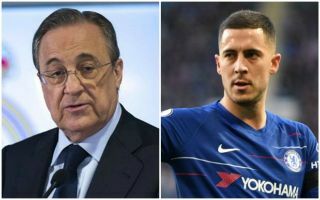 Real Madrid president Florentino Perez couldn’t resist a little joke about the Eden Hazard transfer situation in a lunch event with Chelsea. According to AS, this happened during a meeting between delegates from both clubs ahead of a legends match between the sides. It is not entirely clear what the nature of the joke was from Perez, or what kind of reaction it drew from Blues staff, but AS suggests it shows the strong relations between the two teams. HLN are the latest source to claim Hazard has been the subject of a bid from Real Madrid ahead of the summer, with the Belgium international long linked with the Spanish giants and heading into the final year of his contract at Stamford Bridge. From a Chelsea point of view, there’s certainly not much to laugh about, with the west London club also seeing Thibaut Courtois poached by Los Blancos under similar circumstances last summer. It seems highly likely Hazard will now be following his old team-mate, with the 28-year-old perhaps understandably feeling like he’s given many of his best years to CFC and may now need a move away to fulfil ambitions like winning the Champions League and Ballon d’Or.